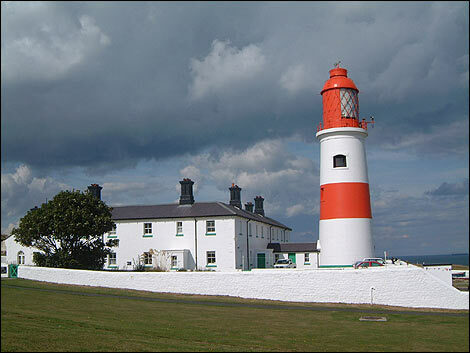 Souter Lighthouse is located on Lizard Point at Marsden, but takes its name from Souter Point, which is located a mile to the south. This was the intended site for the lighthouse, but it was felt that Lizard Point offered better visibility, as the cliffs there are higher. The name was retained in order to avoid confusion with the then recently built Lizard Lighthouse at the Lizard Peninsula, the most southern point at Cornwall. The lighthouse was constructed and opened in 1871, and was built due to the dangerous reefs directly under the water in the surrounding area. In one 1860 there were 20 shipwrecks alone. The lighthouse was decommissioned in 1988 and today is owned by the National Trust. It's thought that the majority of the activity is caused by the spirit of Isobella Darling, niece of Grace Darling who is one of the most celebrated maritime heroines of all time. Staff have reported spoons levitating, cold spots and the feeling of being physically grabbed, with much of the activity reportedly taking place in the kitchen and living areas. A waitress was also surprised to spot at the far end of the kitchen corridor a man in an old-fashioned lighthouse keeper's uniform, who then promptly disappeared. Could it be a former keeper who is responsible for the odor of tobacco experienced many times?